There is unprecedented risk, unprecedented investment, and unprecedented opportunity in healthcare today. 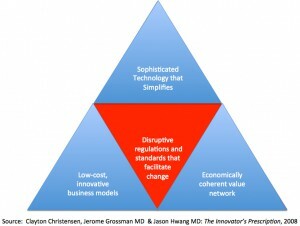 Understanding the mix between regulations, business models of the healthcare industry and the second order effects of the regulations is our unique competency. From investor diligence and vendor assessments to expert witness expertise, we can bring disruptive regulations into context to give clients a clearer picture of the new healthcare landscape. As Christensen noted in his book, The Innovator’s Prescription, disruptive innovation is the result of disruptive regulations, technology that simplifies, economically coherent value networks, and low cost, innovative business models.